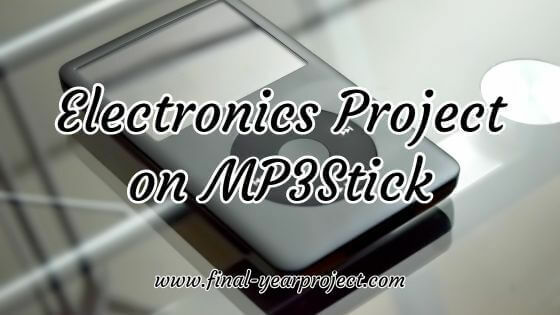 This is "Electronics and Communication engineering project on MP3stick", which also know as "MPEG Audio Layer III". It is basically a digital audio encoding format using a form of lossy data compression. It is a very well known and very common audio format which we hear daily in our life, as well as in audio players. For making this project an ATMEL microcontroller is used which is also the heart of the circuit. You can also Subscribe to FINAL YEAR PROJECT'S by Email for more such projects and seminar. In this Electronics project, decoding of MP3 is done by a VLSI VS1011b decoder integrated circuit. An MMC/SD card works as a memory medium for MP3 files, playlist files and skin files. This MP3 player will its power from a LiIo/LiPo battery with 3.6V. A charger circuit, based on MAX1811, is included in this design. All information will be shown on a Nokia colour LCD with 128×128 pixel and 256 colours. The use in MP3 of a lossy compression algorithm is designed to greatly reduce the amount of data required to represent the audio recording and still sound like a faithful is created using the setting of 128 kbit/s will result in a file that is about 1/11 the size of the CD file created from the original audio source. An MP3 file can also be constructed at higher or lower bit rates, with higher or lower resulting quality. The simplest type of MP3 file uses one-bit rate for the entire file — this is known as Constant Bit Rate (CBR) encoding. Using a constant bit rate makes encoding simpler and faster. However, it is also possible to create files where the bit rate changes throughout the file. These are known as Variable Bit Rate (VBR) files. The idea behind this is that, in any piece of audio, some parts will be much easier to compress, such as silence or music containing only a few instruments, while others will be more difficult to compress. So, the overall quality of the file may be increased by using a lower bit rate for the less complex passages and a higher one for the more complex parts. With some encoders, it is possible to specify a given, and the encoder will vary the bit rate accordingly. Users who know a particular "quality setting" that is transparent to their ears can use this value when encoding all of their music, and generally speaking not need to worry about performing personal listening tests on each piece of music to determine the correct bit rate. Use this electronics project for your reference and study work only and this report includes complete MP3 STICK CODEC for your reference which is basically the code.